The potential success of even the most ambitious video wall project will lessen without an understanding of the new content and sources that dictate its design and performance. So what are these new content needs that are changing the command and control and digital signage space? For starters, think flexible and versatile solutions to accommodate the ever-increasing resolution of video feeds and graphics. Due to simpler and easier creation methods, more and more rich media is becoming available. “And whether content is professionally authored or user-generated, display devices are getting more and more engaging by enabling users, and sometimes an audience, to provide their own content,” said James Chan, vice president of marketing for Mitsubishi Electric Visual Solutions America. “In the command and control space, however, there is a faction where display data remained largely unchanged. In other segments of the market—security monitoring, for example—displays are becoming more interactive, where users are allowed to upload content they have gathered through an input point to the monitoring center. In this case, this largely expands the camera eye of the monitoring system to those integrated to the system, as well as people who have devices that are capable of generating videos. Nonetheless, no matter what change happens with the content, displays for command and control need to be improved constantly, he added, in terms of its ability to display content of varying resolution as clearly and sharply as possible. In the digital signage video wall market, apparently beauty is only screen deep for giving customers the wow factor. Christie’s American Water control room installation uses a Phoenix network-distributed open content management system and a Christie LCD flat-panel video wall display solution, giving American Water the capability to simultaneously monitor its security systems across the U.S., in one centralized location. Good content and high-performance playback devices can help to engage audiences and improve the effectiveness of signage, resulting in longer dwell times, broader reach, and higher brand recognition, noted Richard Heslett, senior product manager for Christie’s Business Products. With requests for touch screens and gesture-based interactivity as major trends, customers also want a range of content for signage-oriented video walls, ranging from a single HD source that is spread across the entire wall, to custom high resolution videos in non-standard aspect ratios, Heslett explained. Future proofing: Every video wall needs it to accommodate future content and usage needs. 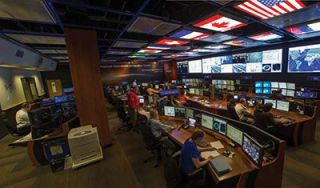 The best way to future-proof your video wall, he concluded, is to choose a processor that offers the options and versatility to meet the ever-changing requirements of customers’ installations without requiring a major reconfiguration of the underlying control system. Another tactic is to install displays that are modular and easily upgradeable and saleable.